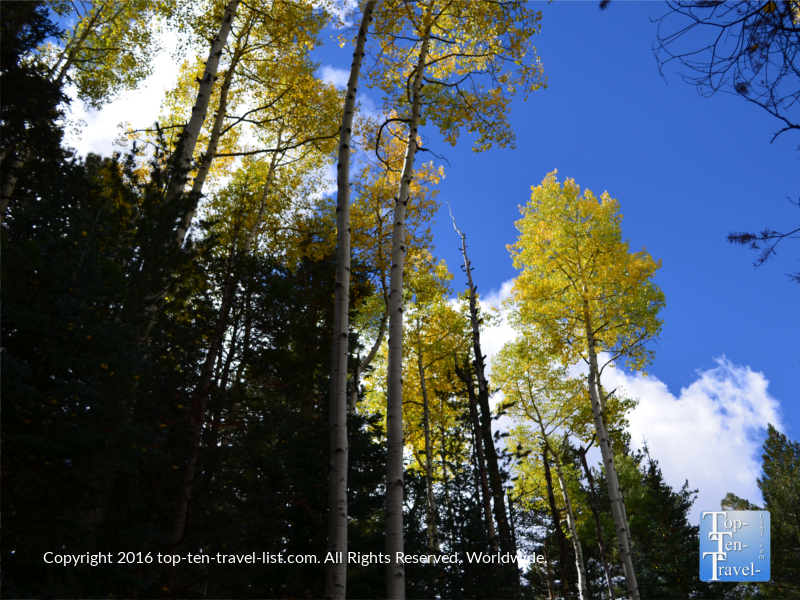 Bear Jaw: A High Altitude Adventure on the San Francisco Peaks - Top Ten Travel Blog | Our experiences traveling throughout the US. 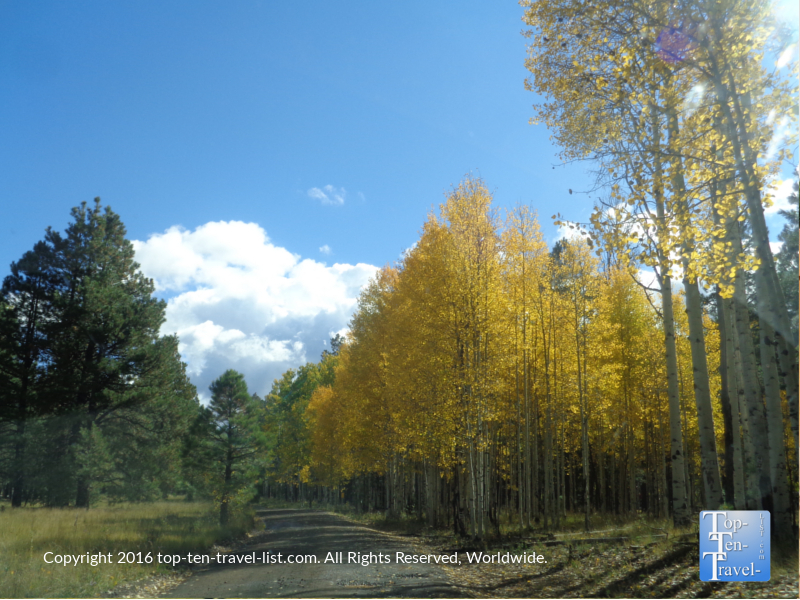 Bear Jaw is one of the most jaw dropping trails in Flagstaff, Arizona, an area known for its’ abundance of picturesque year-round recreational opportunities. As stunning as the scenery is, a hike along Bear Jaw is no easy feat. 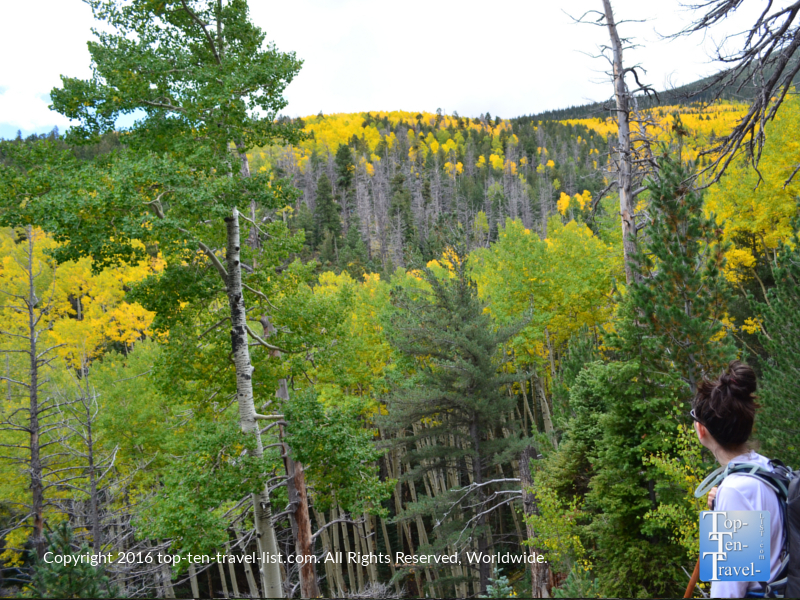 Starting at an elevation of 8550 feet, you will climb over 1000 feet to an ending altitude of 10350 at Waterline Road, where you will be treated to some pretty incredible fall foliage for all your effort. 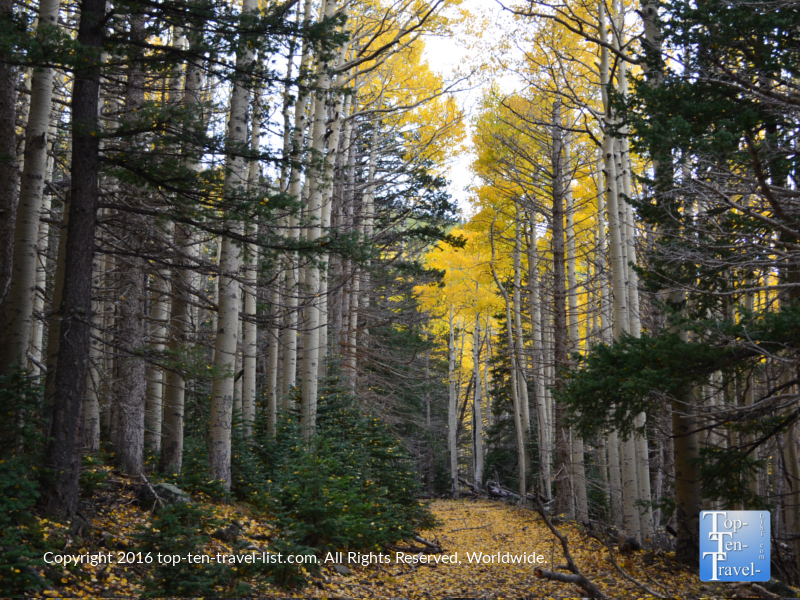 Being located on the north slope of the San Francisco Peaks, the trail offers some pretty incredible mountain scenery. From here, you can walk along Waterline 2 miles to the Abineau trail to make it a long 7 mile loop hike, or simply begin your 2.5 mile return trek downhill for a total hike of about 5 miles. If you are in great shape and used to the high altitude, then a hike along Bear Jaw is an absolute must, both for the stunning beauty and for the peaceful nature experience. 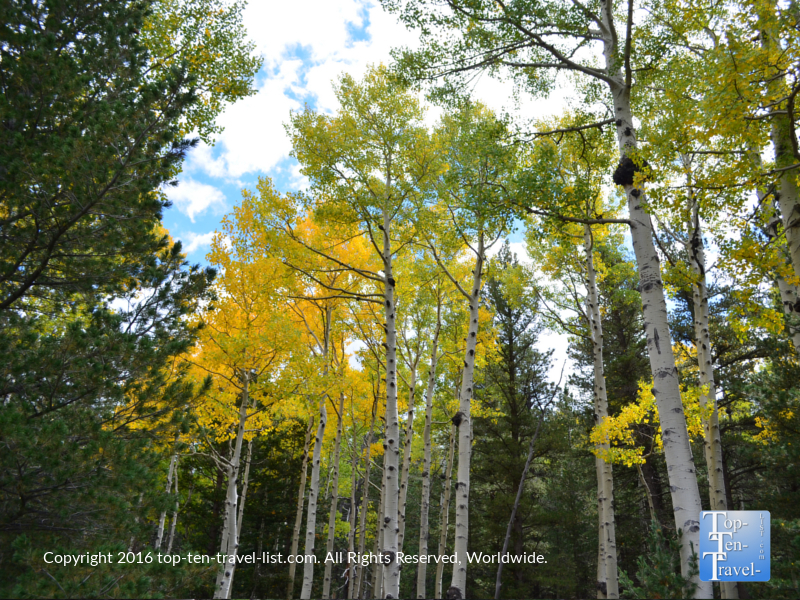 Scenery along the Bear Jaw trail includes a mixed forest of both aspens and pines, making it beautiful in any season. A summer hike takes you past a lush green forest with wildflowers of every hue sprouting up all over the place. As an added benefit, the high altitude means that temps stay really cool all summer long. Not that Flagstaff gets that hot (daytime temps rarely climb past the mid 80’s), however, the intense sun plus 80 degree weather can create quite unbearable conditions for hiking. Bear Jaw is the perfect summer escape for anyone looking for cool weather, a dense forest which blocks most of the sun, and tremendous mountain scenery. A summer hike is fantastic, although a fall hike is even more fantastic. 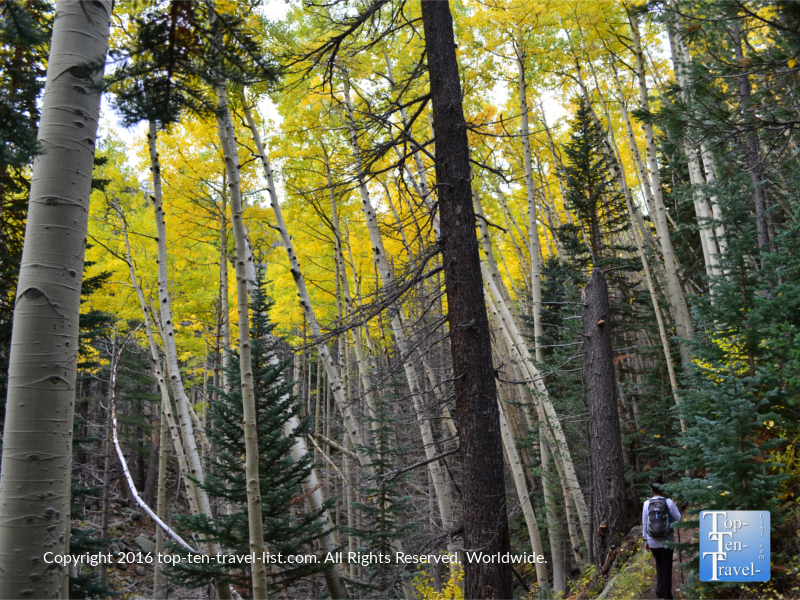 Like most of the other high altitude aspen loaded trails in Flagstaff, the Bear Jaw trail really shines during the stunning fall season. 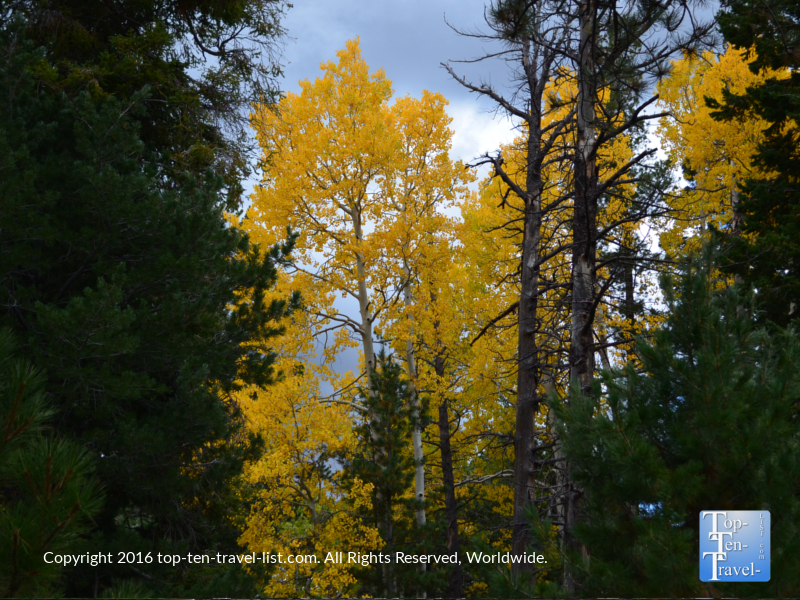 As soon as autumn arrives, all the high altitude trails are loaded with the brightest aspens you will ever see. As soon as this happens, Phoenix locals start coming in droves to see the spectacular fall foliage that they will never find at home. Fortunately, Bear Jaw remains a bit quieter than the more popular trails at Inner Basin and Snowbowl. 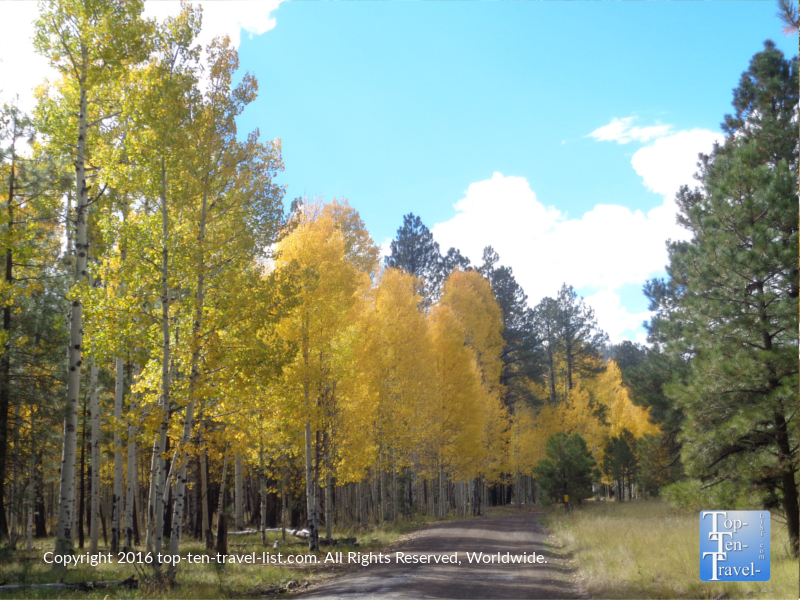 So you get the advantage of being totally immersed in shimmering golden autumn leaves, while also enjoying a peaceful nature experience far away from the tourist crowds and leaf peepers. 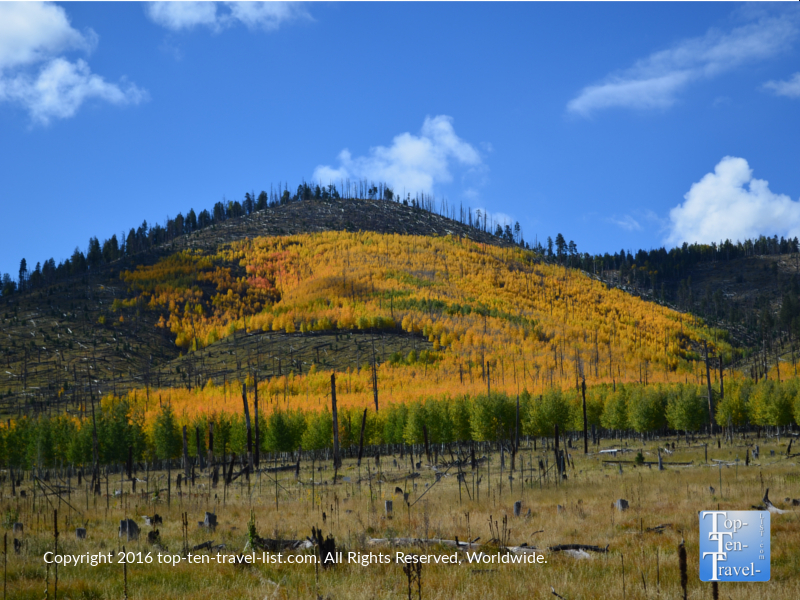 Check out some of the gorgeous fall foliage! Part of the reason the crowds stay away from the Bear Jaw trail is likely due to the very rough and rocky journey along FR 418 required to get to the trailhead. A high clearance vehicle is highly recommended if coming from Hart Prairie Road and required if coming from FR 550 (Lockett Meadow). While my Prius made it coming from Hart Prairie, it was a very difficult and slow drive which took at least 40 minutes. On the bright side, the drive itself is as stunningly beautiful as the hike and you will no doubt be reaching for your camera the entire time. 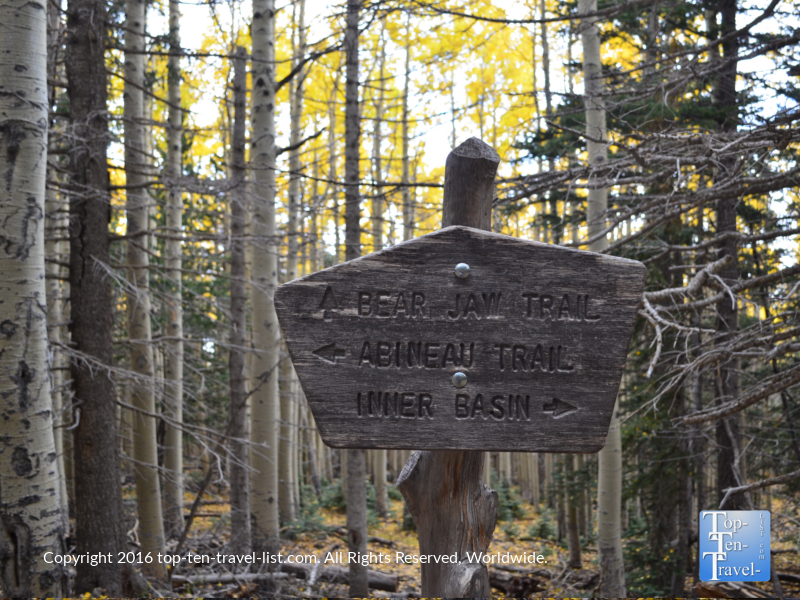 If you have the extra time to spare and the fitness ability, the Bear Jaw is definitely a great addition to any Flagstaff vacation. 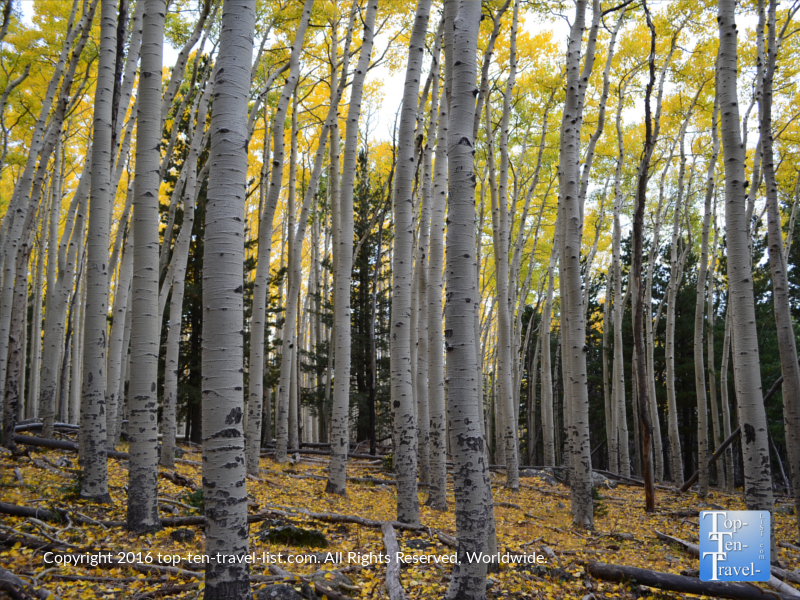 Whether your Flagstaff visit falls in the spring, summer, or winter, Bear Jaw is a hike worth looking into. Bear Jaw is a wonderful experience for nature lovers, hikers, photographers, and leaf peepers. 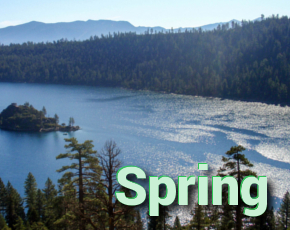 Northern Arizona is a beautiful region of the country with lots to offer in terms of natural beauty. Unfortunately, many visitors fail to leave the over commercialized town and never see anything but the inside of a shop or restaurant! 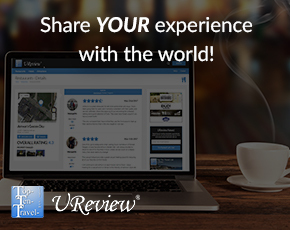 To see the real beauty of the area, you will need to hit the trails. 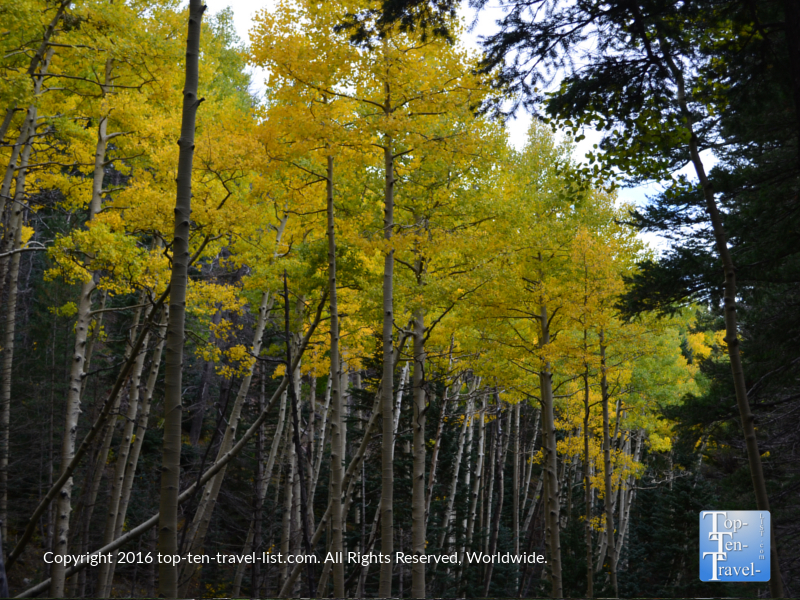 On your trip to the Flagstaff/Grand Canyon area, be sure to take some time to check out a fantastic trail like Bear Jaw which highlights the most magnificent natural scenery in the area. Bring plenty of water. 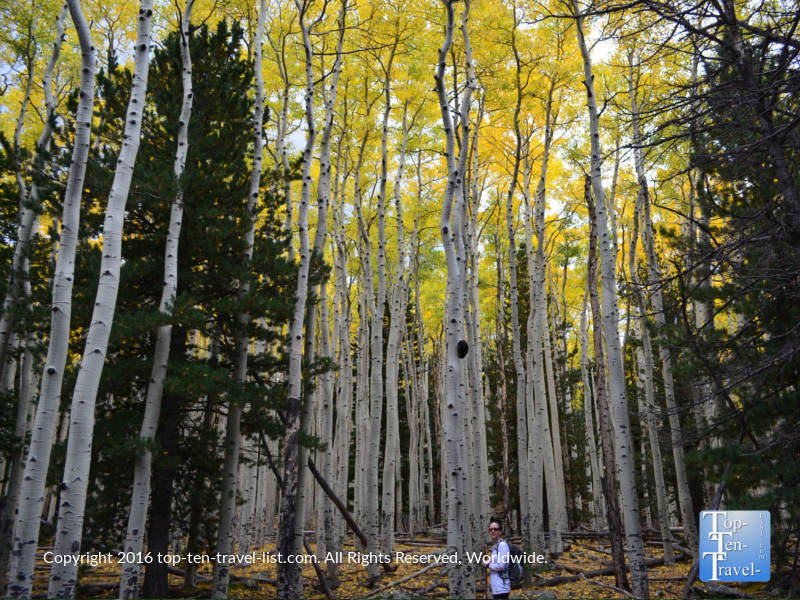 Stay hydrated in a dry, high altitude climate like Flagstaff. I always use a backpack with a built in spot for a hydration bladder. This way I am set on water and also have plenty of extra space for storing essentials like an extra jacket, sunblock, sunglasses, car keys, snacks, etc. Be prepared for random weather changes. Summer monsoons are always a possibility. In the fall, a freak random snowstorm is very possible and has happened in the past. Keep in mind this is a very hard high elevation hike that is very hilly with an elevation gain of over 1000 feet. Even if you do just the Bear Jaw portion (5 miles total) and not the full Abineau loop, it will be difficult and time consuming. Plan on at least a half day including driving time. Check the forecast and try to set out on a day where no precipitation is possible. Lighting related accidents are not that uncommon. In fact, Northern Arizona has some of the highest number of lighting related deaths in the country. Start this hike early in the morning. It takes quite a long time to complete and you do not want to get stuck in the forecast after dark. Plus, the earlier you arrive, the easier it will be to find parking in the tiny lot. If looking for spectacular fall foliage, keep in mind that you will need to complete almost the entire 2.5 mile journey to see the colors. 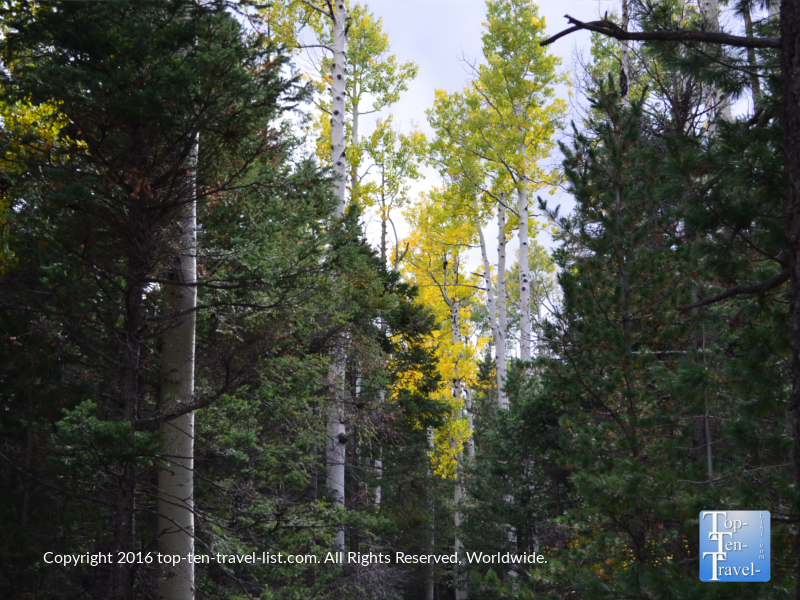 The trail starts off through the ponderosa and eventually converts over to more and more aspens. 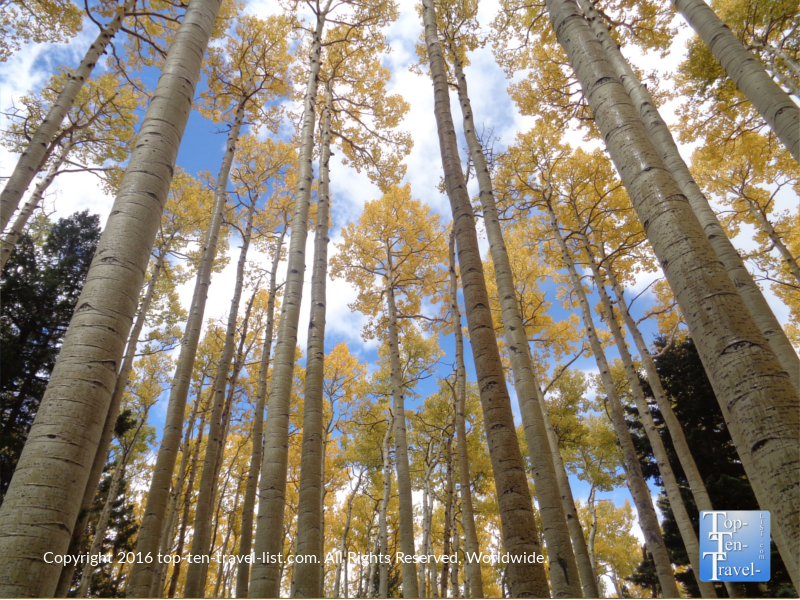 If you do not feel up to a long, strenuous hike, then you should check out a shorter trail like the Aspen Nature Loop or Veit Springs at Snowbowl. Eat a quality breakfast prior to your hike. It helps with altitude sickness to eat more carbs. Also pack plenty of snacks in your backpack for the hike itself. If you are looking for a quick, budget friendly snack pre-hike, I recommend Late for the Train. They serve the best espresso drinks in town and have the tastiest burritos for just 5 bucks. Other decent choices include The Toasted Owl, Horsemen’s Lodge, and Cracker Barrel. Bear Jaw is located about 25 miles outside of Flagstaff. If coming from the West (US 180), you will want to drive NW out of Flagstaff on 180 for 19.5 miles and then turn right on Hart Prairie Rd (FR 151). Drive 1.5 miles until reaching FR 418 where you will turn let. Drive 3 miles until reaching FR 9123J and turn right. Drive another mile or so until reaching the trailhead (high clearance vehicle highly recommended). 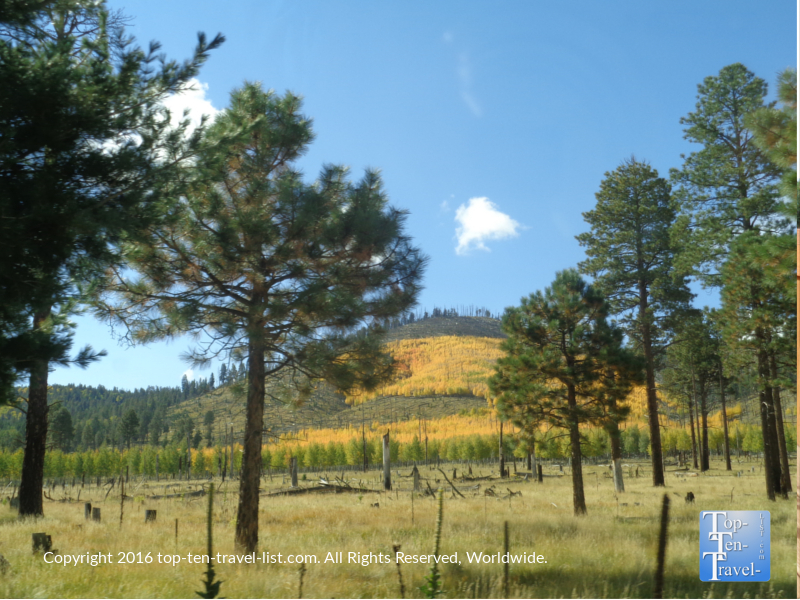 If coming from the East (89), you will want to drive NE of Flagstaff onto 89 for 12 miles and turn left on FR 552 (directly across from the turn off for Sunset Crater). Turn right at FR 418 and drive about 7 miles to FR 9123J. Make a left onto FR 9123J and drive about a mile or so to the trailhead. There is no fee to park at the trailhead. No bathrooms or water at the start of the trail.